I'm so over winter and ready for spring. It's still quite cold here, and we're still bundling up in wool and snow suits with plenty of snow on the ground. Yet, we're opening the windows a bit during the day to air out the house. I'm tired of the stuffiness of a house shut up for winter. I'm ready to do a declutter, purge, and thorough spring cleaning! Care to join me? I usually spend a week purging, a week deep cleaning, a week organizing and a week on the miscellaneous repairs or special projects. I divide the house up into zones to tackle on each day, and always give myself a day off each week to take a break and enjoy. This month I am also planning a birthday party for my daughter on the 13th, so I need to leave myself enough time to get that done. I'll be deep cleaning the entire house, however these are the areas that I plan on concentrating on this year that I know need a little extra help. 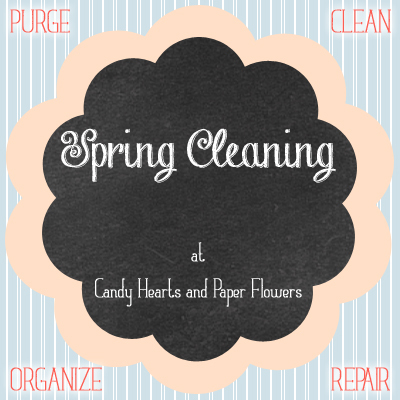 For purging: closets, linens, my drawers, and the kitchen. If you'd like to jump around and do your own thing, but are looking for some sort of guide, check out the September ShapeUp Guide from a few years ago. I do a bit of a mini "spring cleaning" in the fall as well to get ready for the holidays and get all the summer bits put away and pull out all the cozier things we need for fall and winter here. Otherwise, join along here and on Facebook.